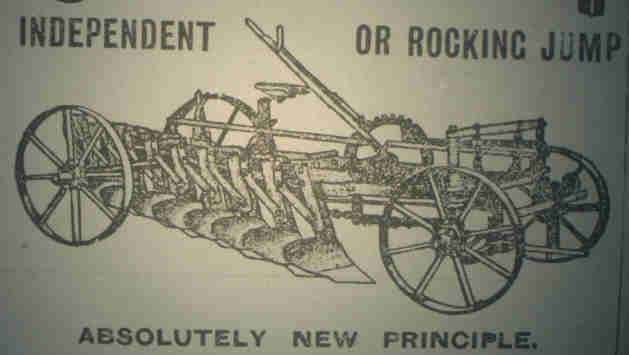 This plough will cause a complete revolution in tilling uncleared land. The Smith Brothers, Richard Bowyer and Clarence Herbert, were some of the most important people associated with the improvements of South Australian agriculture. Until the invention of the Stump Jump Plough by Richard in 1876, and the later development and perfection by Clarence, South Australian farmers in the mallee lands had a soul destroying and almost impossible task to clear their land and make a living from wheat growing. Most farmers still ploughed the land in the English manner with deep and complete turned furrows. This was done to kill the weeds which grew furiously in that damp climate. This practice was impossible in Australia and particularly on Yorke Peninsula which was heavily timbered with mallee. Richard, born in London in 1837, arrived with his parents, Owen and Mary Ann, aboard the Trusty in Port Adelaide on 15 May 1838. During the 1850s the Smith family followed the many thousands of South Australians to the Victorian goldfields where Clarence was born on 9 August 1855. The Smith family had twelve children but only six survived childhood. After their return to South Australia Richard started work, as an apprentice, for James Gardner Ramsey at Mount Barker where he eventually rose to the position of foreman. Richard later opened a blacksmith and carpenter's shop at Port Wakefield where his younger brother Clarence started as his apprentice in 1872. While at Port Wakefield, Richard invested in some land at Kalkabury and started farming while still working part time for his old boss at Mount Barker. While attempting to clear his land it was that Richard got the idea of a stump jump plough which would ride over the stumps rather than be stuck in or behind them. In 1876 he had produced a three-furrow model but it proved too heavy. Improvements were made by Clarence and the next year it was demonstrated at the Moonta Agricultural Show with much better results. Both their single and triple ploughs won first prizes. Although most farmers at the show, and later, could or would not see the benefits of such a machine, history proved him right as it made grubbing a thing of the past. When Clarence had completed his apprenticeship, he continued farming at Kalkabury and even bought some of his brother's land. For the next four years he tried to improve the plough and when finally convinced that he had it right he bought some land in Ardrossan and built a factory and a house for his wife, Emma Sarah Beck and daughter Beatrice. Production was started in 1880, with credit provided by G.P.Harris, Scarfe and Company, and by the end of the year gave employment to twenty men eventually growing to more than a hundred. Richard was awarded a five hundred Pound bonus for his invention by the South Australian government in 1882. At the 1883 Maitland Show, Clarence and his machines took first place once again. Richard moved to Western Australia in 1884 set up a manufacturing plant at Beverly and retired when he was 74. He died in 1919, aged 81 years. Slowly the Ardrossan works expanded as orders started to come in from all over Australia. In 1900, when everything looked so well, doctors told Clarence, who had now six children, that he only had a year to live. Clarence prepared his sons Clarence Glen, born at Ardrossan in 1882, and Alma, O.Smith, born in 1885, to take over his factory and when he died on 15 July 1901 they were ready to face the tasks of running a huge business. A marble plaque to honour Clarence Herbert Smith was later placed in the Ardrossan Institute. Both Glen and Alma lived up to their father's expectation. Despite their youth, they, with the help of their mother, successfully managed and even expanded the range of products and the business. Those mallee roots which were such a problem to the farmers were used to advantage by Glen and Alma. In 1905 the economic conditions were good enough for Glen to get married to Hilda Nankivell of Minlaton. In 1906 the brothers decided to solve the water shortage problem for their steam boiler, which supplied the power supply of the factory, by using the mallee roots to generate gas which in turn operated electric generators. They built a new power house opposite the factory and installed underground cables to the plant. In the Cyclopedia of South Australia, it was stated that 'it would be difficult for any resident to conceive an idea of the town existing without the factory. In 1906 such extensive alterations and additions were made to the plant and buildings that the factory is now one of the largest and best equipped in the Commonwealth'. 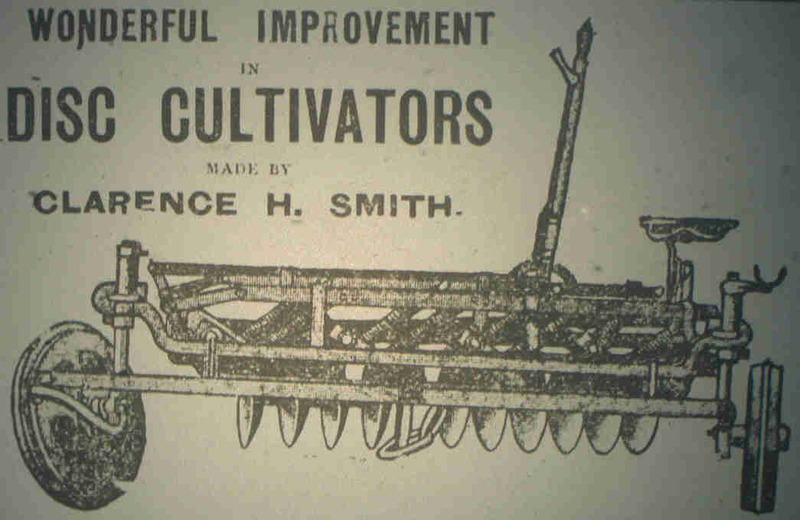 A nine furrow stump jumping, cultivating plough with a seed and fertilizer drill was developed which would plough, manure and seed in one operation. It once again took many first prizes at the Adelaide and country shows. Unfortunately the brothers were not able to cope with the downturn in the Australian, and world wide, depression of the 1930s. They struggled on bravely but as many of their customers were unable to pay and some suppliers unwilling to give credit, C.H. Smith Limited ceased operations in 1934.